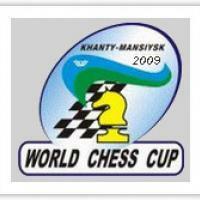 The Chess World Cup gets underway on the 21 November in Khanty Mansiysk, Russia. In recent years, the Chess World Cup has become a regular qualifying event in the WCC cycle, even though the cycle itself has frequently changed, sometimes while still ongoing! The last World Cup in 2007 was won by Gata Kamsky, thereby earning him his ill-fated match with Topalov earlier this year. As things currently stand, the winner of the 2009 World Cup will gain entry to the 8-player Candidates tournament that will decide a challenger for the winner of the Anand v Topalov WCC title match in April next year. The event follows the KO format used by the FIDE World Championships in the late 90's/early 00's. 128 players are paired in 2-game mini-matches, with the winner progressing to the next round of 64, and so on until a 4-game final. Any tied matches are settled by rapid games, and if necessary, blitz games followed by an Armageddon game. Games start at 3pm local time, with the time control being a fairly brisk 90 minutes for 40 moves, followed by 30 minutes to finish, with a 30 second increment from the start. Top seed is Boris Gelfand, and the full draw is below. Further details at the official site here.